This entry was posted in Art, Books, Exhibitions, Journalism, London, Museums, Music, Recession and tagged free, listings, Time Out. Bookmark the permalink. I thought that quite a lot of emphasis was given to smaller venues and also freebies (although given the horrid weather outdoor cinema won’t rank high on a list of readers’ priorities this week). Time Out probably attracted quite a lot of casual purchasers who were tourists, but the re-launch had a feel of a magazine for Londoners. I’m not sure whether a letters page will add anything to the mag, given the multiplicity of opportunities for venting one’s spleen these days.Suffice to say that I started reading at Tower Hill and finished at Earl’s Court, so good for a commute. The last seven words of my review might be positive, but the previous seven hundred are at best neutral. If nothing else, the new magazine is excellent value for money. Listings were the only reason to buy TO, so now there’s no real reason to pick it up to be honest. Talk about misunderstanding and negelecting your core strength! And yes, I stopped buying it years ago because the listings just weren’t very interesting/useful. 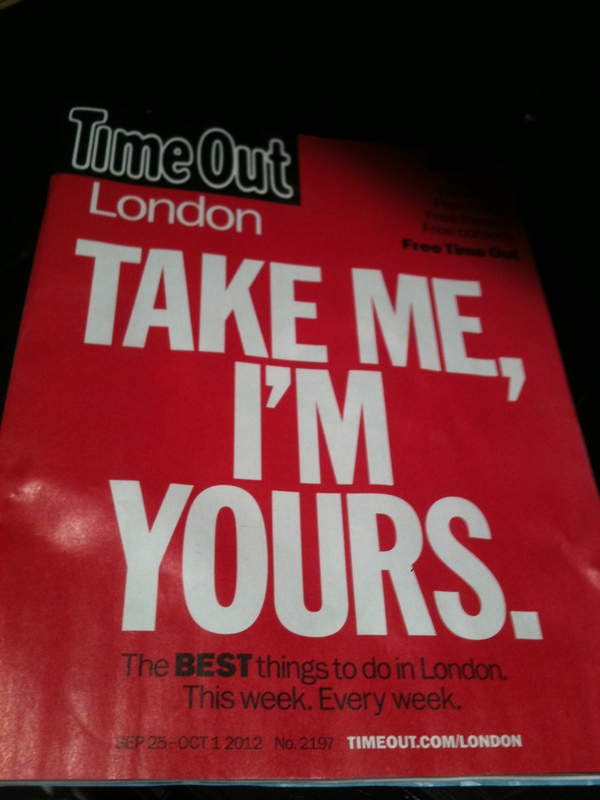 Time Out listings haven’t gone anywhere, they are all online in their multitude on the Time Out website – the place most Time Out readers departed to instead of buying the mag. The new mag just distills the listings and features the best – including the avant-garde. But Guy is takes absolutely ages to find anything via the website searches, it’s badly tagged, cumbersome, mixes listings in with articles so you have to scroll page after page to get simple information. A total mess. I don’t even bother picking up their free Mag now; their advertisers would have my atttention if the free mag was the listing part!